It happened. You reached the end of another Dungeons & Dragons published adventure. At this point the player characters might be 5th, 10th, or 15th level (or somewhere around there). They love their characters and want to keep playing. There’s other published adventures to play, but you’re enjoying this story and don’t want it to end. Can you keep it going? Of course you can! It’s D&D! You can do what you want. 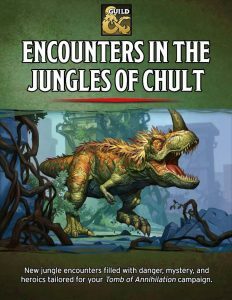 I’ve got some suggestions below for how to continue the stories of your favorite published D&D adventures after the big bad bites the dust. Be warned! There are spoilers ahead for the published D&D adventures. The Black Spider Was Just the Beginning. The Black Spider is a member of a much larger cabal of evil drow that search for magic forges and magic items. They plan on amassing all they can before arming a battalion of drow, blacking out the sun, and conquering Faerûn’s surface world. The characters must take out the drow operations on the surface and then journey into the Underdark to stop them. The Terror of Venomfang. The green dragon Venomfang has a strong chance of living through the adventure, given the low level of the characters and the high challenge rating of the dragon. The Black Spider’s death creates a power vacuum that Venomfang fills. The dragon uses the remaining minions to sack and conquer Phandalin before using that army and wealth to plunder progressively larger settlements. It’s up to the characters to hunt down and stop Venomfang (and when they kill the dragon, mommy Venomfang comes looking for vengeance). Rise of Tiamat likely ends with Tiamat being pushed back into the Nine Hells and the Cult of the Dragon suffering a massive defeat. With such a grand finale, how could one look to further this story? Into the Hells. Tiamat might be back in the Nine Hells, but she isn’t dead. If the characters want to put down the evil dragon goddess for good, they need to collect a set of epic weapons forged from the bones of ancient metallic dragons scattered across Faerûn, find a way to get into the Nine Hells, get to Tiamat’s fortress, fight their way to her through devils and dragons, and then kill her with the weapons. Cult Wars. The defeat at the Well of Dragons leaves a power vacuum in the Cult of Dragon. The remaining cultists battle for dominance in the organization, and they don’t care how many innocents die. One faction of the cult courts chromatic dragons, stealing treasure and capturing humanoids to offer to the dragons and win them over. The other believes in the old ways of the cult and creates dracoliches. This latter group seeks to capture Faerûn’s mages to create the undead dragons. Both factions clash in spectacular and destructive ways in populated cities as they perform their evil deeds. The characters must find and put down the leaders of both factions, who are hidden in separate, secret fortresses. Revenge of the Princes. The remaining Princes of Elemental Evil are furious with the characters for foiling their plans. 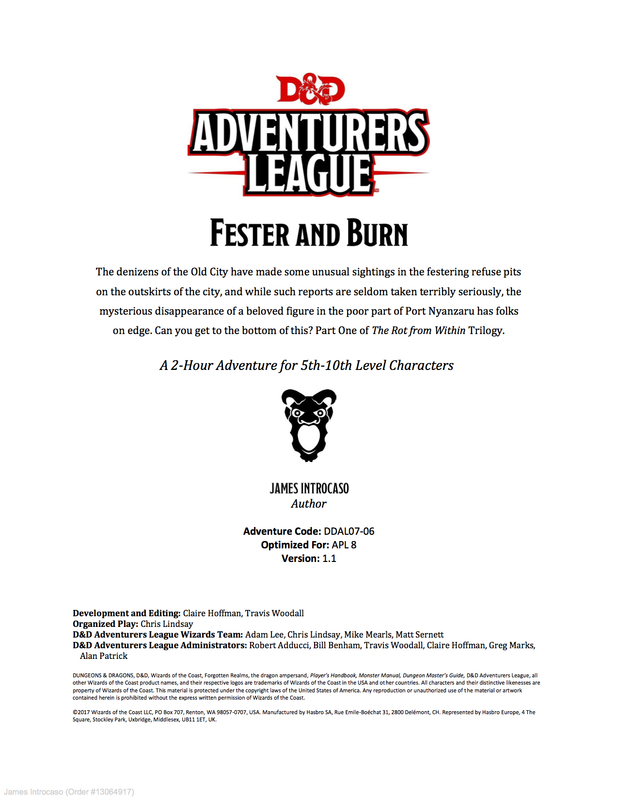 In an act of defiance powerful, vengeful cultists that lived through the ordeal corner the characters and perform a ritual that transports the entire party into one of the elemental planes. The characters must survive and find a way back to the Material Plane. This adventure could take them to more elemental planes and see them facing off with all of the Princes of Elemental Evil (including the one they previously vanquished). Restore the Balance. 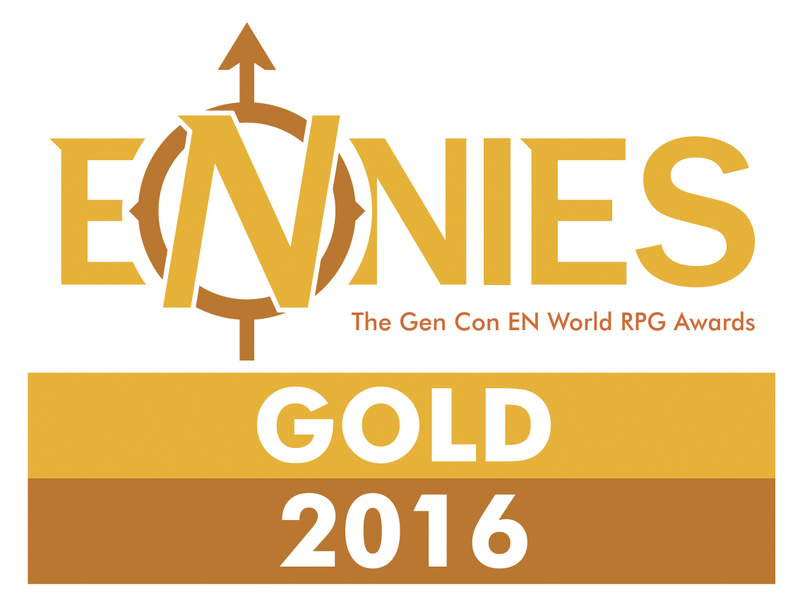 The Princes of Elemental Evil are defeated, but the lingering effects of the magic of their cults remains. Severe weather events and natural disasters become sudden and common in Farûn and lay waste to cities and villages. The characters must permanently sever the connection of the Material Plane to the Princes of Elemental Evil, but to do so they must find the sacred components for and perform a ritual that summons the remaining three princes into Faerûn at the same time and defeat them. Out of the Abyss likely ends with the characters defeating many of the demon lords and sending them back home, but that doesn’t need to be the end of the story…. Orcus Among Us. I was always sad we didn’t get to see the whole story of my favorite demon lord in Out of the Abyss but now you can. When Orcus was crushed by Demogorgon, he didn’t return to the Nine Hells. The undead mind flayer collective he rules in the Underdark latched onto their master before the Abyss could take him and transported him to the colony. From this bastion, Orcus sends his alhoons into other mind flayer colonies to kill elder brains and recruit new servants. As his undead ranks swell, a terrified and shrinking living illithid populace seeks out the characters’ help. They’ve vanquished demon lords before. Can they do so again? Frenemy Demon Lord. The demon lords returned to the Abyss to find that in their absence Lolth consolidated power. The Queen of Spiders is the one who sent the demons away in the first place and it was her plan all along to make a power grab in the infinite layers. Graz’zt uses his power to bring the adventurers who defeated him into the Abyss. He promises that the demon lords shall not attempt to return to Faerûn or incite violence there for 10,000 years if the adventurers can imprison Lolth to another plane of existence. Whether they take the deal or not, the adventurers find themselves trapped in the Abyss with demon lords who hate them and must get out. Curse of Strahd likely ends with the characters killing Strahd and returning home. There’s not much left in this story… or is there? Put Down Strahd… Forever. Curse of Strahd states that Strahd von Zarovich will eventually return to Barovia… but what if they could stop that? The only way to keep Strahd from returning to Barovia is to find weapons that will kill and the names of the Dark Powers. After that, it’s just a simple matter of hopping through the multiverse and hunting down each one. Oops! When the characters defeated Strahd it seemed everything was finally at peace in Barovia. The monsters were gone. That’s only because the monsters knew the mists of the land would recede once Strahd died. They took that moment to escape back into the home plane of the adventurers! The characters find their old homes overrun with undead, hags, werewolves, and more. 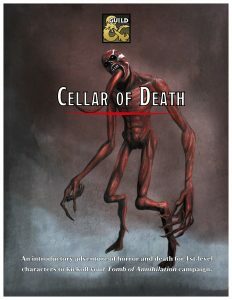 To save their world, the characters must find a way to treat with the Dark Powers and offer up a powerful evil to take Strahd’s place in Barovia. Giant Lord Round-Up. There’s five giant lords (or maybe six) in Storm King’s Thunder. Odds are your group only put down one. King Hekaton asks the characters to go after the rest as he tries to restore the Ordning. The Jotun Awakens. The smashing of the Ordning awoke an ancient force deep in the earth. A Jotun giant (see Tome of Beasts) comes to Faerûn and declares war on King Hekaton, killing every giant and humanoid that does not bow before it. It’s up the adventurers to fight this Jotun’s servants and uncover a way to kill the nigh unstoppable foe. Kill Acererak. The adventurers may come up with this one on their own. Easier said than done to kill the old lich, since his phylactery is hidden somewhere in the multiverse. They must delve into his other tombs (like that one of horrors) to find more information about the old lich, where he makes his lair, and where he hides his phylactery (or phylacteries if you like). If you do this, be sure to pull out every nasty trap you ever dreamed of. About That Dragon Turtle. Tomb of Annihilation has multiple horrors in Chult that stay in the area long after the atorpal has been destroyed. 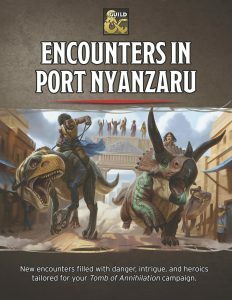 Adventurers could stick around and battle the dragon turtle in the sea, helping cull the undead threat, explore ruins for treasure, and help restore those taken by the death curse by acquiring plenty of diamonds. Here’s a quick poll to let me know which adventure you’d like to play or run most! Have you continued one of the published adventures beyond its pages? If so, let me know how in the comments below. Apologies for having so many product updates lately! So much of my time and energy has gone into the Guild Adepts creations that I haven’t had much time to do original work for the blog. Here’s the latest and greatest I want to share! 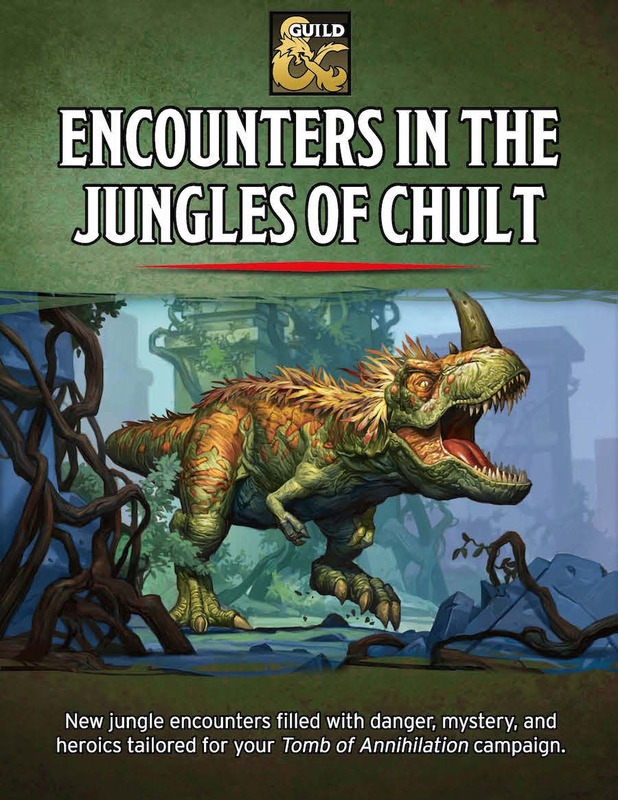 Encounters in the Jungles of Chult has the work of seven Guild Adepts and features 10 new jungle encounters that can be added to any Tomb of Annihilation campaign. 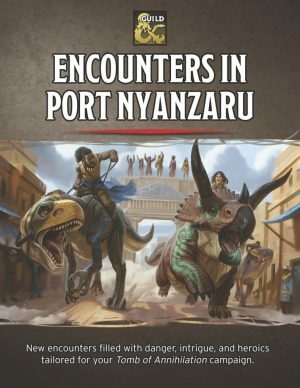 Combat, danger, intrigue, and pulp are all yours in this exciting supplement. 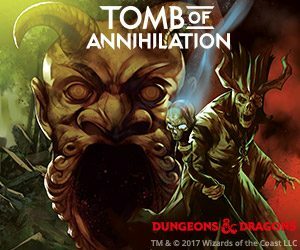 James Introcaso sits down with Celeste Conowitch from Venture Maidens, Joe Della Bella from You Meet in a Tavern, Josh Perault from Taking Initiative, and Lauren Urban from Dungeon Drunks to discuss the Podcasts of Annihilation and the new D&D adventure, Tomb of Annihilation. 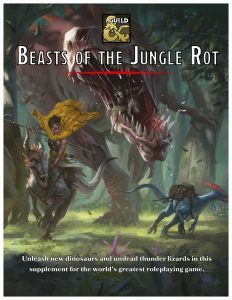 Last week I showed you my new DMs Guild Adepts products, including Beasts of the Jungle Rot. Though the product is jam-packed with new dinosaurs and even more zombie dinosaurs, there was one prehistoric beast I left out because it wasn’t a reptile. 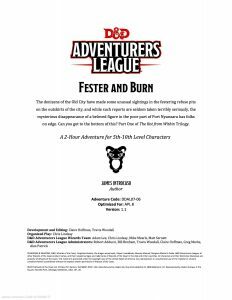 But that beast is one of my favorites so I’m sharing it with you for free in the PDF below. 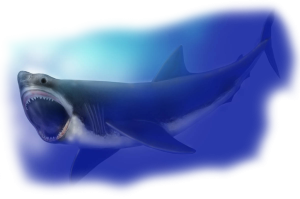 BEHOLD THE MEGALODON AND MEGALODON ZOMBIE! Let me know what you think, and feel free to add this guppy to you Tomb of Annihilation campaign if your player characters choose to sail the high seas! And if you’re interested in more Free Game Resources, check out that page on this site!